Elle’s life seems like one struggle after the next. She’s facing life after a divorce, learns that her ex-best friend is pregnant with her ex-husband's baby, and the house she’s willed after her estranged father’s death comes with a catch. When she thinks her life can’t get any more difficult, her neighbor seems determined to rile her up on a daily basis. He’s gorgeous and looks like he’s walked off a movie set, but his attitude is enough to leave Elle feeling sour despite the tingles she feels when he’s around. But one stolen kiss leads to a number of stolen nights blurring the line between hatred and love. Elle’s curse of bad luck may be taking a turn, or she could be facing her toughest obstacle yet – heartbreak. Growing up, Renee always found a way to pursue her creativity. It began by watching endless runs of White Christmas- yes even in the summer – and learning every word and dance from the movie. She could still sing Sister Sister if requested. In high school she joined the show choir and a community theatre group, The Troubadours. After marrying the man of her dreams and moving from her hometown she sought out a different artistic outlet – writing. 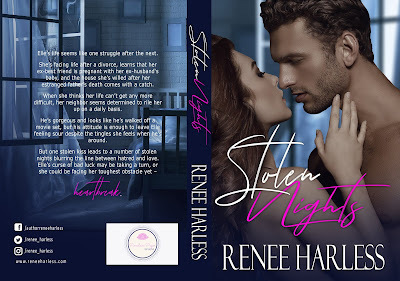 To say that Renee is a romance addict would be an understatement. When she isn’t chasing her toddler around the house, working her day job, or writing, she delves head first into a romance novel.